Here's the final wrap-up of 2014! The theme for myself, as well as my classes, was getting unstuck -- letting go of the things holding back your life and creativity, and discovering the freedom to move forward that had been there all along. I summed up some of my classes for the Capitol Hill Arts Workshop blog, so people who didn't live in the DC area or for some other reason couldn't make it to my classes could still follow along. Here are the links. I hope they open up your heart to more reading and writing! Week Three: Where in the World Is NaNoWriMo? The final installment of student-submitted class excerises from this year's NaNoWriMo workshop! Here is...an exercise from me! Enjoy. Here's part two of the writing exercises my students shared with me from this year's NaNoWriMo workshop! Enjoy. In November, I taught a class (co-hosted by the Capitol Hill Arts Workshop at the DC Public Library) on how to break through writer's block and complete your NaNoWriMo project. I had a blast completing a bunch of inspiring writing games with my talented class. I promised to post any work from the class they sent to me, on my website. To my dismay, just as the class wrapped up I ran into some technical difficulties, and then the holidays descended and I didn't get the time to fulfill my promise. I hope you guys aren't too miffed, but here they are at last: your writing games stories! I'll post them in separate pieces throughout the week. Enjoy! Bulfinch named Notable Teen Book for 2014 by Shelf Unbound! Bulfinch was named a Notable Book for 2014 in the Teen category by Shelf Unbound Magazine! Guys, guys, guys. Something really cool just happened. It's funny I got this news shortly after wrapping up the NaNoWriMo class I was teaching here in DC. For our last class, I broke from the writing games format, and gave a talk on the methods available to aspiring authors seeking publication today. That led to an honest and engaging discussion with the class about everyone's hopes and fears, dreams and nightmares, all set in the writing world. The message I share with anyone who asks (and many who haven't) is this: Don't write to get rich and famous. Don't write for elite literary recognition. Don't write even in hopes of a mediocre career eking out a living with trashy novels. All these things are too uncertain, and talent alone doesn't assure any of them. Write only if you feel like you couldn't live without writing, because writing for any other reason is completely insane. The universe is keeping me honest, because I can assure you I'm not rich and famous yet. And while being named a notable book by an online magazine mostly read by publishing nerds may not seem like a big deal to anyone outside of the publishing nerd world, it is a really really really big deal to me. Because about seven months ago, I quit my job. Let me repeat: I quit my really cool, creative and exciting job helping to run a children's book imprint (!) to focus more on my writing. That's how thoroughly I believe that writing books, and getting my books into the hands of readers, is what I was put here to do. It's more than a little nuts, but it feels 100% right to me. The thing is, it is a looooooooong road to validation with a decision like that. And while I'm pretty sure I'd stick with this lifestyle no matter what -- teaching classes, stitching together an income from freelance work, making my own schedule every day and giving writing time a high place in my priorities -- it is kind of a relief to hear people actually enjoy the results. I feel a little less crazy. I mean, it's still crazy. But now, it's less lock-her-up-crazy and more crazy like that eccentric aunt with the extensive salt and pepper shaker collection who still manages to live an independent life and even remembers to send you a Christmas present every July. So that's why this is a really important milestone for me. And it wouldn't be a blog post without an appeal to my readers, would it? I know that you guys are my friends, family, and loyal readers who have been with me for a while now, and most of you have probably already got your copies of Bulfinch. But remember: readers of Notable Books are Notable People. Notable People command the respect and admiration of others, do Notable Things like cross the ocean blue, and make Notable Recommendations. Be a Notable Person, and tell your friends to read Bulfinch. Let's keep this thing rolling. Oh yeah, get Bulfinch on Amazon here. Don't Miss my FREE NaNoWriMo Workshop! Let published novelist Hannah Sternberg help you reach your National Novel Writing Month (NaNoWriMo) goals this year with a series of classes on working through writer’s block. Using fun group writing exercises, and tips for individual practice, these classes will unlock your creativity and get the words flowing! Each class can be taken individually, or come to all four and combine the lessons for a revolution in your writing technique. This special program is produced through a partnership between the Capitol Hill Arts Workshop & the SE Branch of the DC Public Library. If you have any questions regarding the Get Unblocked! Writer's Block Clinic, please contact us at (202) 547-6839. Click HERE to RSVP--walk-ins are welcome if there is room, but space is limited! Read the individual class descriptions, and RSVP, here! I'll linkback my CHAW blog posts here too, so you can follow along if you subscribe to my site. Check out my events page for details on three exciting new events! I'll be doing signings at Tryst and Ebenezers, plus I'll be leading a four-week "writer's block clinic" for National Novel Writing Month, hosted by the DC Public Library and Pound Coffee. I hope to see you there! Bulfinch Kindle Countdown Deal - Get it while it's hot! Bulfinch is on sale in the Kindle store for only $0.99 - but the deal won't last forever, as the price will increase incrementally until it returns to $7.99 at the end of next week! The sooner you buy it, the cheaper it will be, so don't miss this deal! Click here to buy Bulfinch on Kindle. It's been a great couple of weeks, so I thought I'd bring you, dear website readers, up to speed on the latest Bulfinch adventures! I did my first ever video interview! Check it out here: I'm talking about Bulfinch's journey to publication, as well as the innovations that are occuring in the publishing industry that made it possible. I also did a really fun Q&A with Lisa de Pasquale. Find out what movie line I wish I could say to everyone, and what the best present I ever got as a kid was! Read it here. ...and Bulfinch was reviewed in The Hill Rag, local Capitol Hill neighborhood newspaper! 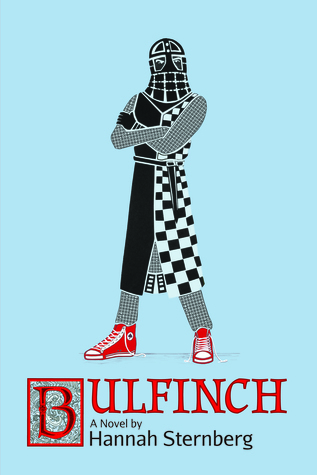 "Told with a playful sense of whimsy, Bulfinch is a time-traveling delight full of humor, conflict, and a poignant introduction to the realities of adulthood." Read the full review here. There are only a few days left in the GoodReads giveaway of Bulfinch, so don't forget to sign up in the post below!